Adrian "Addie" Joss (April 12, 1880 – April 14, 1911), nicknamed "The Human Hairpin," was an American pitcher in Major League Baseball (MLB). He pitched for the Cleveland Bronchos, later known as the Naps, between 1902 and 1910. Joss, who was 6 feet 3 inches (1.91 m) and weighed 185 pounds (84 kg), pitched the fourth perfect game in baseball history. His 1.89 career earned run average (ERA) is the second-lowest in MLB history, behind Ed Walsh. Joss was born and raised in Wisconsin, where he attended St. Mary's College and the University of Wisconsin. He played baseball at St. Mary's and then played in a semipro league where he caught the attention of Connie Mack. Joss did not sign with Mack's team, but he attracted further major league interest after winning 19 games in 1900 for the Toledo Mud Hens. 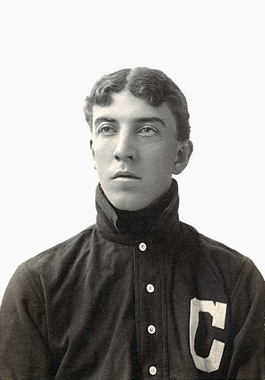 Joss had another strong season for Toledo in 1901. After an offseason contract dispute between Joss, Toledo and Cleveland, he debuted with the Cleveland club in April 1902. Joss led the league in shutouts that year. By 1905, Joss had completed the first of his four consecutive 20-win seasons. Off the field, Joss worked as a newspaper sportswriter from 1906 until his death. In 1908, he pitched a perfect game during a tight pennant race that saw Cleveland finish a half-game out of first place; it was the closest that Joss came to a World Series berth. The 1910 season was his last, and Joss missed most of the year due to injury. In April 1911, Joss became ill and he died the same month due to tuberculous meningitis. He finished his career with 160 wins, 234 complete games, 45 shutouts and 920 strikeouts. Though Joss played only nine seasons and missed significant playing time due to various ailments, the National Baseball Hall of Fame's Board of Directors passed a special resolution for Joss in 1977 which waived the typical ten-year minimum playing career for Hall of Fame eligibility. He was voted into the Hall of Fame by the Veterans Committee in 1978. Connie Mack also sent a scout to watch Joss and later offered the young pitcher a job playing on his Albany club in the Western League, which Joss declined. :p.22 In 1899, Joss played for a team in Oshkosh, earning $10 per week ($285 in today's dollars). After player salaries were frozen by team owners, Joss joined the junior team in Manitowoc, which had been split into two teams, as a second baseman and was soon promoted to the senior squad, where he was developed into a pitcher. He was seen by a scout for the Toledo Mud Hens and in 1900 accepted a position with the team for $75 per month ($2,137). :p.22 While in Ohio he was considered "the best amateur pitcher in the state." He started the Mud Hens' season opener on April 28 and earned the win in the team's 16–8 victory. He won 19 games for the club in 1900. After the season ended, Joss returned to Wisconsin where he led Racine to the 1901 Wisconsin baseball state championship against Rube Waddell's Kenosha squad. He also enrolled at Beloit College and played American football. :p.47 It was reported that Joss had signed with the Brooklyn Dodgers of the National League as early as August 18 and received a $400 advance ($11,397), but Joss denied receiving any money. :p.47 Mud Hens owner Charles Stroebel stated that he had signed Joss and other Mud Hens players for the 1902 season on August 12 and that the Western League was under the protection of the National League through September 1901. Before 1901 ended, the Cleveland Bronchos offered $500 ($14,246) to Toledo in exchange for Joss and manager Bob Gilks, who would be a scout for Cleveland. Toledo and Joss agreed and Joss was now a member of the American League, which was paying a premium on baseball talent to rival the National League. :p.22 Dodgers owner Charles Ebbets invited Joss for a meeting, which Joss declined, and Joss let it be known that he had told Stroebel he would play for the Mud Hens for the 1902 season and received a $150 ($4,109) advance in February 1902. Joss made his major league debut with the Cleveland Bronchos (also known as the Bluebirds) against the St. Louis Browns. The Browns' Jesse Burkett hit a shallow pop fly in the direction of right fielder Zaza Harvey. Home plate umpire Bob Caruthers ruled that Harvey did not make a clean catch, so Burkett was credited with a hit. (Harvey and witnesses said the ball never hit the ground.) Joss finished his major league debut with a one-hitter. Joss compiled a 17–13 record and 2.77 ERA during his major league rookie season. He led the American League with five shutouts. On October 11, 1902, Joss married Lillian Shinivar in Monroe, Michigan. Shinivar was in attendance when Joss made his professional debut with the Mud Hens in 1900. The couple had a son, Norman, and a daughter, Ruth. :p.35 Following the conclusion of the 1902 season, Joss was selected to the All-Americans, an all-star team from the American League who played exhibition games against their counterparts from the National League. To begin the 1903 season, the Cleveland organization changed the team's name to the "Naps" in honor of shortstop Nap Lajoie. In Joss' second year, he went 18–13 and lowered his ERA from the season before to 2.19. His walks plus hits per inning pitched (WHIP) was a MLB-low 0.948. For the 1904 season, the 24-year-old Joss went 14–10 with a 1.59 ERA and did not give up a home run during the season. Illness during the season reduced his starts. He had his first of four 20-win seasons in 1905 as he ended the season with a 20–12 record and 2.01 ERA. He finished with a career-high 132 strikeouts. In 1906 his 1.72 ERA was third in the league and he finished with a 21–9 record and tied a career-high with nine shutouts. To begin the 1907 season, Joss won his first 10 starts. He threw two one-hitters on the season, the first on September 4 against the Detroit Tigers and the second on September 25 versus the New York Highlanders. When teammate Heinie Berger threw his own one-hitter on September 26, it marked just the second time since 1900 that two pitchers from the same team had thrown back-to-back one-hitters. Joss finished the season with career-bests in wins (finished 27–11) and 338 2⁄3 innings pitched. His win total tied with Doc White for highest in the American League and his WHIP was second-best (behind Cy Young) while both his complete game (34) and shutout (6) totals were third-best in the league. For the season, Joss averaged 0.83 walks per nine innings, becoming one of 29 pitchers in MLB history to average less than one walk per nine innings. His season-ending WHIP of .806 is the fifth-lowest single-season mark in MLB history. The Naps finished with a 90–64 record, a half-game behind Detroit. It was the closest Joss ever got to a World Series appearance. After amassing four consecutive 20-win seasons, he struggled in 1909 as a result of fatigue; by September he was shut down for the season. Joss finished the year with a 14–13 record in 242 2⁄3 innings pitched and recorded a 1.71 ERA. He finished fourth in the American League in ERA and third in WHIP (.944). He pitched a second no-hitter on April 20, 1910 against the White Sox, becoming the first pitcher in MLB history to no-hit the same team twice, a feat not matched until Tim Lincecum of the San Francisco Giants no-hit the San Diego Padres in both 2013 and 2014. In the second inning, the White Sox' Freddy Parent hit a ball toward third base. Bill Bradley failed to field the ball cleanly and thus his throw to first base was not in time to get Parent out. The initial ruling on the field was a base hit but it was later changed to an error. Joss gave up two walks and recorded 10 assists. He made just 13 appearances that season due to a torn ligament in his right elbow. He made his last appearance of the season on July 25, and left the game in the fifth inning due to arm soreness. The Naps finished 71–82. In his final major league season, Joss finished with a 5–5 record in 107 1⁄3 innings. The Naps finished the year 71–81. This marked the fifth time in Joss' nine years that the franchise finished with a losing record. Of his 160 major league wins, 45 were shutouts. Joss' 1.89 career ERA is ranked second all-time (to Ed Walsh), while his 0.97 WHIP is the lowest career WHIP in MLB history. :p.27 He finished with a 160–97 record, 234 complete games, and 920 strikeouts. Joss's repertoire included a fastball, a "slow ball" (today known as a changeup), and an "extremely effective" curve. Baseball historians Rob Neyer and Bill James ranked Joss' fastball third (1900–1904) and sixth (1905–1909) in the major leagues. George Moriarty explained that Joss had only one curveball because "he believed that with a few well mastered deliveries he could acquire great control and success with less strain on his arm." In an era filled with spitball pitchers, Joss achieved his success without ever altering the baseball. Joss threw with a corkscrew windup motion, described as "an exaggerated pinwheel motion." Shortstop Roger Peckinpaugh described his windup: "He would turn his back toward the batter as he wound up, hiding the ball all the while, and then whip around and fire it in." Illness and injury accompanied Joss throughout much of his professional career. In 1903, a high fever forced him to miss the last month of the season. He contracted malaria in April 1904 and then missed several starts with a back injury in 1905. He later also wrote for the Cleveland Press and covered the World Series for the News-Bee and Press from 1907–1909. The Press introduced Joss in columns this way: "Of all the baseball players in the land, Addie Joss is far and away the best qualified for this work. A scholarly man, an entertaining writer, an impartial observer of the game." Biographer Scott Longert wrote that "the writer was becoming as well-known as the ballplayer." An editorial in the Toledo Blade said, "In taking his vocation seriously, [Joss] was, in return, taken seriously by the people, who recognized in him a man of more than usual intelligence and one who would have adorned any profession in which he had elected to engage." During the 1908–1909 offseasons, Joss worked on designing an electric scoreboard that would later be known as the Joss Indicator. The Naps decided to install the scoreboard, which allowed spectators to monitor balls and strikes at League Park. Joss attended spring training with Cleveland before the start of the 1911 season. He collapsed on the field from heat prostration on April 3 in an exhibition game in Chattanooga, Tennessee. :p.27 He was taken to a local hospital and released the next day. :p.200 As early as April 7, press reports had taken note of his ill health, but speculated about "ptomaine poisoning" or "nervous indigestion. ":p.28 The Naps traveled to Toledo for exhibition games on April 10 and Joss went to his home on Fulton Street where he was seen by his personal physician, Dr. George W. Chapman. :p.28:p.69 Chapman thought Joss could be suffering from nervous indigestion or food poisoning. By April 9, as Joss was coughing more and had a severe headache, Chapman changed his diagnosis to pleurisy and reported that Joss would not be able to play for one month and would need ten days of rest to recover. Joss could not stand on his own and his speech was slurred. On April 13, Chapman sought a second opinion from the Naps' team doctor, who performed a lumbar puncture and diagnosed Joss with tuberculous meningitis. [b] The disease had spread to Joss' brain and he died on April 14, 1911 at age 31. In 1981, Lawrence Ritter and Donald Honig included him in their book The 100 Greatest Baseball Players of All Time. They described what they called "the Smoky Joe Wood Syndrome", where a player of truly exceptional talent has a career curtailed by injury or illness. They argued that such a player should still be included among the greatest all-time players, in spite of career statistics that would not quantitatively rank him with the all-time greats. They believed that Joss' career ERA was proof enough of his greatness to be included. Baseball author John Tierney wrote: "Joss is remembered for a remarkably low career ERA, but it should be noted that he pitched in a time before earned runs were compiled as an official statistic, and his career ended in 1910, before the American League introduced its new baseball in 1911, leading to a nearly 25 percent increase in runs scored." Joss was inducted into the Cleveland Indians Hall of Fame on July 29, 2006. He was inducted in the same class as Ray Chapman, Rocky Colavito, Al López, Sam McDowell, Al Rosen and Herb Score. a Sources differ on the number of one-hitters. Porter states six one-hitters while Schneider lists five. :p.200 A career summary at the time of his Hall of Fame selection noted seven in total which is consistent with records at the time of Bob Feller's eighth one-hitter in 1946. 1 2 "Fame Beckons Joss, MacPhail". Milwaukee Sentinel. United Press International. January 31, 1978. p. 2. Retrieved November 8, 2012. ↑ "Addie Joss". Wisconsin Historical Society. Retrieved November 5, 2012. ↑ "Birth Record Details". Wisconsin Historical Society. Retrieved July 23, 2009. 1 2 3 4 5 6 7 8 Porter, David L. (2000). Biographical Dictionary of American Sports: G–P. Westport, Connecticut: Greenwood Press. p. 775. ISBN 0-313-31175-7. Retrieved November 5, 2012. 1 2 3 4 5 6 7 8 9 10 11 12 13 14 Coffey, Michael (2004). 27 Men Out: Baseball's Perfect Games. New York: Atria Books. ISBN 0-7434-4606-2. 1 2 3 4 5 6 7 8 9 "Addie Joss Statistics and History". Baseball-Reference.com. Retrieved November 5, 2012. 1 2 3 Schneider, Russell (2004). The Cleveland Indians Encyclopedia. Champaign, Illinois: Sports Publishing. ISBN 1-58261-840-2. Retrieved November 7, 2012. 1 2 3 4 5 6 7 8 9 10 11 12 13 14 Semchuck, Alex. "Addie Joss". Sabr.org. Society for American Baseball Research. Retrieved November 7, 2012. 1 2 3 4 5 Buckley, Jr., James (2012). Perfect: The Inside Story of Baseball's Twenty Perfect Games. Chicago: Triumph Books. ISBN 978-1-60078-676-1. Retrieved November 5, 2012. 1 2 3 4 5 6 Pajot, Dennis (2011). Baseball's Heartland War, 1902–1903: The Western League and American Association Vie for Turf, Players and Profits. Jefferson, North Carolina: McFarland & Company. ISBN 978-0-7864-6337-4. Retrieved November 7, 2012. ↑ La Russa, Tony; Purdy, Dennis (2006). The Team-by-Team Encyclopedia of Major League Baseball. New York: Workman Publishing. p. 350. ISBN 978-0-7611-5376-4. ↑ "1907 American League Pitching Leaders". Baseball-Reference.com. Retrieved November 8, 2012. 1 2 3 4 Lewis, Franklin A. (2006). The Cleveland Indians. Kent, Ohio: The Kent State University Press. ISBN 0-87338-885-2. Retrieved November 8, 2012. ↑ Goldman, Steven (September 8, 2006). "You Could Look It Up: No Hits For You". Baseball Prospectus. Retrieved November 8, 2012. ↑ "Perfect Games by Pitchers". Baseballalmanac.com. Retrieved November 5, 2012. ↑ Wilbert, Warren N. (2003). What Makes an Elite Pitcher? : Young, Mathewson, Johnson, Alexander, Grove, Spahn, Seaver, Clemens and Maddux. McFarland & Company. p. 88. ISBN 0-7864-1456-1. Retrieved November 5, 2012. ↑ "Single-Season Leaders & Records for Walks & Hits per IP". Baseball-Reference.com. Retrieved November 8, 2012. ↑ "1908 American League Season Summary". Baseball-Reference.com. Retrieved November 8, 2012. ↑ "1909 American League Pitching Leaders". Baseball-Reference.com. Retrieved November 8, 2012. ↑ McEntire, Madison (2006). Big League Trivia: Facts, Figures, Oddities, and Coincidences from our National Pastime. Bloomington, Indiana: AuthorHouse. p. 86. ISBN 1-4259-1292-3. Retrieved November 8, 2012. ↑ "1909 American League Season Summary". Baseball-Reference.com. Retrieved November 8, 2012. ↑ Baldassaro, Lawrence; Johnson, Richard A., eds. (2002). The American Game: Baseball and Ethnicity. Carbondale, Illinois: Southern Illinois University Press. p. 32. ISBN 0-8093-2445-8. Retrieved November 8, 2012. ↑ "Cleveland Indians Team History & Encyclopedia". Baseball-Reference.com. Retrieved November 8, 2012. ↑ "Career Leaders & Records for Earned Run Average". Baseball-Reference.com. Retrieved November 5, 2012. ↑ "Career Leaders & Records for Walks & Hits per IP". Baseball-Reference.com. Retrieved November 8, 2012. 1 2 3 4 5 Kneib, Martha (2005). Meningitis. New York: The Rosen Publishing Group. ISBN 1-4042-0257-9. Retrieved November 5, 2012. ↑ Poremba, David Lee (2000). The American League: The Early Years. Chicago: Arcadia Publishing. p. 41. ISBN 0-7385-0710-5. Retrieved November 8, 2012. ↑ Neyer, Rob; James, Bill (2004). The Neyer/James Guide to Pitchers: An Historical Compendium on Pitching, Pitchers and Pitches. New York: Fireside. pp. 28–29. ISBN 0-7432-6158-5. Retrieved November 8, 2012. 1 2 Gutman, Bill (2008). "Shine On, Superstar". What If the Babe Had Kept His Red Sox? : And Other Fascinating Alternate Histories From the World of Sports. New York: Skyhorse Publishing. ISBN 978-1-60239-629-6. Retrieved November 8, 2012. ↑ Honig, Donald (1977). The Man in the Dugout. Chicago: Follett Publishing Company. ↑ Husman, John R. (2003). Baseball in Toledo. Charleston, South Carolina: Arcadia Publishing. p. 107. ISBN 0-7385-2327-5. ↑ Frommer, Harvey (1992). Shoeless Joe and Ragtime Baseball. Lincoln, Nebraska: University of Nebraska Press. p. 26. ISBN 978-0-8032-1862-8. Retrieved November 8, 2012. 1 2 3 4 Fleitz, David L. (2001). Shoeless: The Life and Times of Joe Jackson. Jefferson, North Carolina: McFarland & Company. ISBN 978-0-7864-3312-4. Retrieved November 5, 2012. 1 2 3 Lew Freedman (2010). The Day the Stars Came Out: Major League Baseball's First All-Star Game, 1933. Jefferson, North Carolina: McFarland & Company. ISBN 978-0-7864-4708-4. 1 2 Whatever Happened to the Hall of Fame? : Baseball, Cooperstown, and the Politics of Glory. New York: Fireside. 1995. p. 334. ISBN 0-684-80088-8. Retrieved November 8, 2012. ↑ Berkow, Ira (1986). Red: A Biography of Red Smith. Lincoln, Nebraska: University of Nebraska Press. p. 195. ISBN 978-0-8032-6040-5. Retrieved November 8, 2012. ↑ "Hall of Fame changes rules". St. Petersburg Times. October 4, 1977. p. 3C. Retrieved November 8, 2012. ↑ Tierney, John P. (2004). Jack Coombs: A Life in Baseball. Jefferson, North Carolina: McFarland & Company. p. 187. ISBN 978-0-7864-3959-1. Retrieved November 8, 2012. ↑ "Indians resurrect hall of fame". The Vindicator. Youngstown, Ohio. Associated Press. July 12, 2006. p. C4. Retrieved November 8, 2012. ↑ "Baseball Hall of Fame Inducts 3". Pittsburgh Post-Gazette. August 8, 1978. p. 14. Retrieved November 8, 2012. ↑ "Feller Sets New Mark With Eighth One-Hitter of Career". Ottawa Citizen. Associated Press. August 9, 1946. p. 14. Retrieved November 8, 2012. Wikimedia Commons has media related to Addie Joss.